I Spy with my little eye....a Nine Patch! Do you ever walk by old quilt tops for sale, wrinkled or balled up, and say, "Meh?" There is little interest in only a quilt top I've observed. Casual collectors around here want quilts even if they are what some call cutters. Cutter quilts have so much damage they might only have a small section usable for cutting down into a craft project. Quilt hunter and gatherers will pass these orphaned tops with little more than a second glance. Could that be a big mistake? A friend of mine said he found a quilt top, and did I want it? Sure. Such a sucker, I will take almost anything quilt related. If nothing else, a top may have an interesting fabric in it. Often there is some redeeming information to find in them even if they have a hole or flaw. You can even use a damaged quilt top to patch a good one needing small repairs. I gave the top my smell test--no funkiness detected, balled it back up, and took it home. Once home I hung it from the standing frame, and stood back. Oh, my goodness! There was a hidden Nine Patch in that quilt top, and I loved it! Cowboys were a big theme during the 1930's and 1940's thanks to traveling rodeos, and The Lone Ranger. The Wild West theme persisted into the 1950's. Asian-inspired prints were popular after WWII ended in 1945. The graphic style of the other prints feel like the 1950's to even the 1960's. This top was completely stitched by hand in small, regular stitches. I only endeavor to hand sew like this. At 65" x 92", this is a large quilt top, well-constructed, and quite collectible, in my humble opinion. If you are interested in collecting something in textiles, and short on space or cash, a top can be a good choice. 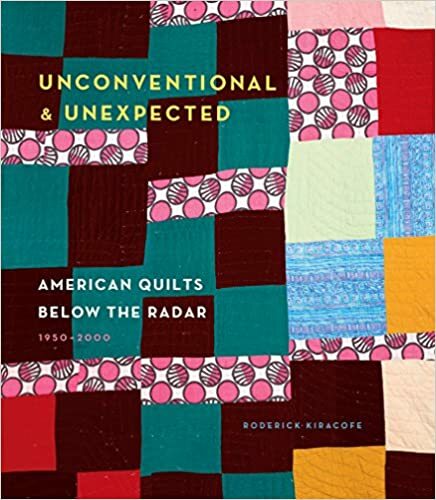 For more information, and to immerse yourself in the eclectic quilt styles of the latter half of 20th century quilts, check out this wonderful book. My copy is fully tagged with Post-It tabs meaning it's a keeper. This link is an affiliate link to Amazon meaning I receive a small compensation if you choose to purchase the book. It costs you nothing, and keeps this blog up and running. Thank you for your support. Also, if you like what you see and read here at Pink Doxies, follow through Bloglovin', email, or any of your favorite spots. Find all the buttons in the right sidebar, and thank you again. Oh Julie, I just love the quilt! I wish I could find some vintage ones in my area to buy and treasure. The stitching is just wonderful. Do I have to come back to get some quilts? Thank you for sharing. I will look for the book. I agree with you that most quilt tops have redeeming features - although sometimes they are sewn together badly and the pieces are too small to be of much use if reclaimed. But my favorite vintage purchase was a truly ugly quilt top (and I say that from a viewpoint that there are few truly ugly quilts) that nonetheless was made up of nice large pieces of feedsack fabrics. 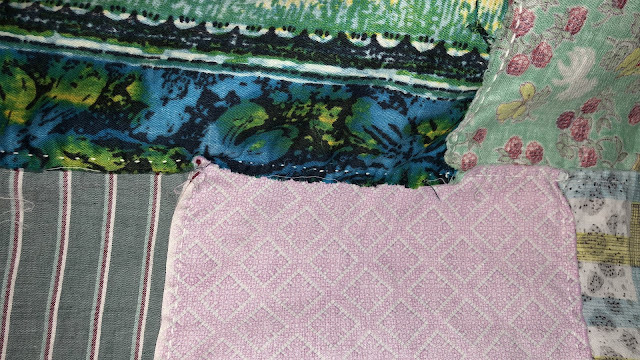 I have repaired many vintage quilts since then using pieces from that quilt top, and still have a lot of it left. Jumps right out at me. Thanks for the lead on the book! I love your quilt, there's something so special & so inviting about vintage quilts! I love that quilt. I also love vintage quilts. 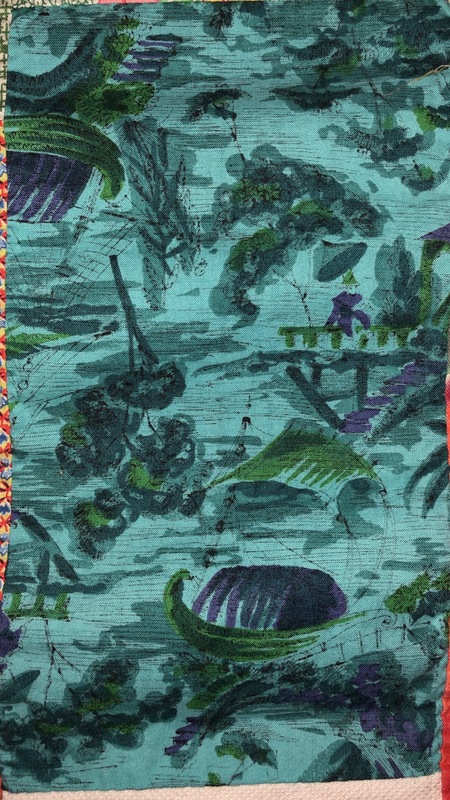 What fun vintage fabrics in that vintage treasure. What a wonderful top, Julie. I do the sniff test, too. It's impossible to get some odors out of fabric. The thing I love best about this quilt is that narrow light blue strip running down the center of the quilt. It's just charming! If I ever have to do that in a quilt I hope, some descendant in a future generation will say the same thing. I saw an old, really simple quilt at a thrift store on Monday that I was tempted to buy. But when I unfolded it I found that nearly every piece of fabric was in shreds. I took a few photos (that I may post) and folded it back up. If the fabrics had been intact it would have been a bargain at $2.99.